Odor-Eliminating Spray naturally eliminates incontinence odors on contact. Medical-grade advanced formula bonds to odors caused by urine and feces, absorbing and breaking them down. 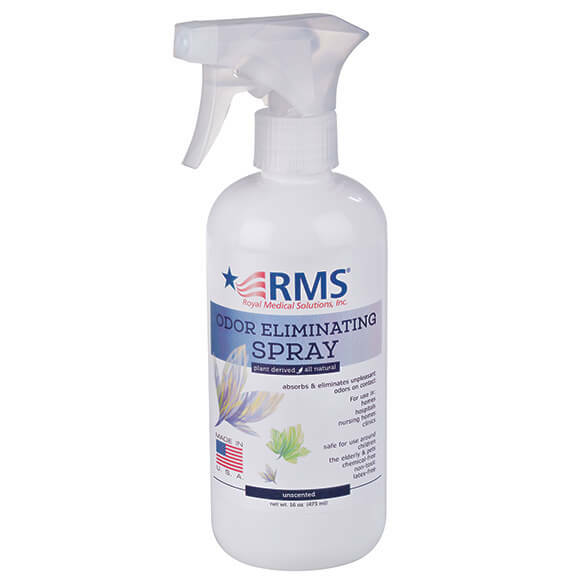 Spray this safe, natural odor eliminator directly on bedding, fabric, furniture, wastebaskets and more. Also great for eliminating pet and other odors in your house or vehicle. Odor removal formula contains no synthetic fragrance, air pollutants, enzymes, artificial colors or additives, parabens, phthalates, triclosan, formaldehyde or other harmful chemicals. I have furry friends and I think this would be great. Incontinence issues for 91 yr old mother. Acceptable to spray vinyl or plastic and allow to dry or wipe down?